I was never good at jumping rope. Double Dutch just about scared me out of the playground. Not only could I not jump but I was also kicked off the rope turning team. That is the epitome of incoordination. As an adult, jumping rope still scares me. When I think of doing it my body cringes with pain. It’s not until I pick up the rope and get going that I am reminded of what an amazing activity jumping rope can be. It’s no wonder it is a mainstay of boxing training. While I am a long way from pulling off the “floating like a butterfly” part of the equation, I can now do various moves. 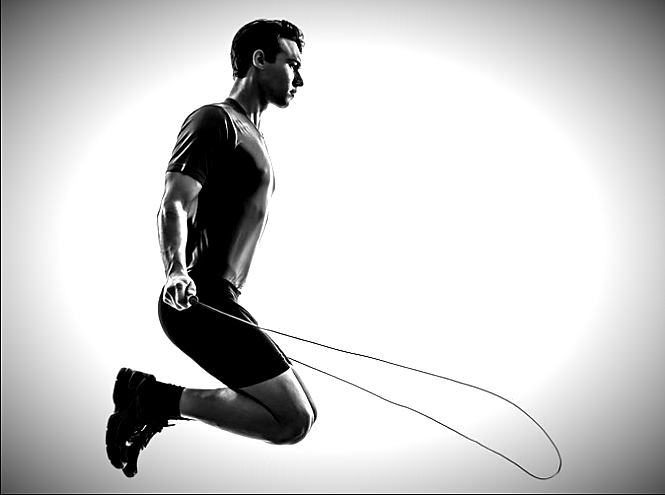 I believe jumping rope is one of the most perfect training activities. First it is totally accessible. All that is needed is a rope, and a small area with a high ceiling or no ceiling (the weather is changing folks). Second, it takes no time at all. A couple of minutes a few days a week can make a huge difference in your fitness level. Lastly, there are total body benefits to be gained from this exercise. Purchase a good rope that doesn’t get twisted because that is frustrating, and makes the jumping part even harder. Use a yoga mat to jump on (or another non-slip mat) to add cushioning. Start with no rope and do 5 gentle jumps (work on landing softly) while you turn your hands like you have a rope in them. Rest for a few seconds, and repeat a few times. Add the rope to the equation. Stick with 5 small jumps, and stop. Repeat. When you’re comfortable with the 5 in a row, take it to 6, and then 7, etc. When you’re ready, look up other movements that you can challenge yourself with like side-to-side, one foot forward, crossovers, etc. There is tons of information on the Internet. It’s important to increase the challenge a little bit at a time. It can be over days, weeks or months. It doesn’t matter. Every jump that you do is one more then you did before. Bit by bit, you will get stronger. This is a cardio weight bearing exercise. It’s good for your heart, your muscles and your bones. Then, when you add the fancy tricks, you add improved coordination to the list. How perfect is that?